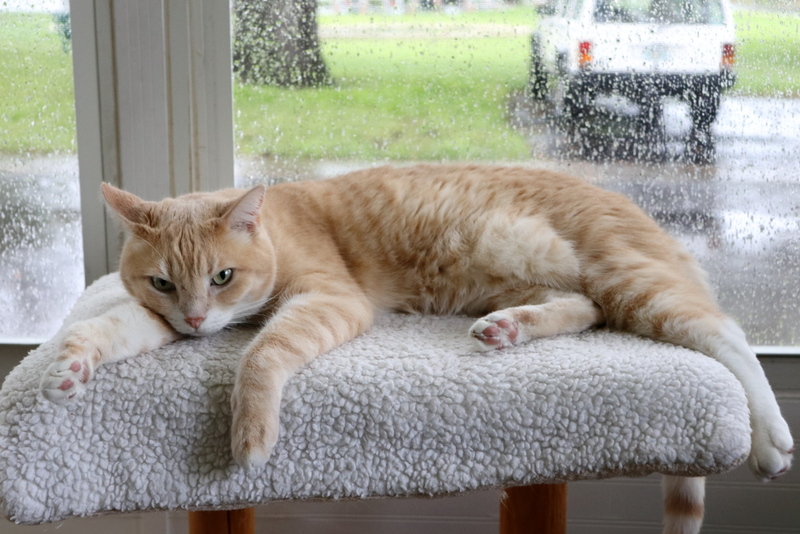 Frankie is not happy that there is no outside catio at our new house and the rainy day didn’t help his mood. This entry was posted in Uncategorized on August 31, 2018 by Charles Huss. A visit there would be nice. I wish I could send you some of our rain. The name “The Sunshine State” will have to be changed soon. Oh dear……well, at least there are some nice big windows to keep an eye on things…!! It is a great view for them. Poor Frankie…it’s going to be a while before there is another catio…he’ll just have to enjoy the Florida room! That won’t satisfy him for very long. Aw sweet Frankie, that expression says it all! He looks bored, doesn’t he? Well, that’s a bummer. At least you have some big windows to look out of. Oh, he looks totally annoyed – he thinks he should have had a say in picking the new place! He probably would have picked our old place by the Marina. Sad or bored. I can’t tell. He will be fine when the sun comes out. Poor thing. He really does look disgruntled.